I got into collecting Transformers shortly after the first movie, so I missed out on pretty much everything in the Classics line. I mean, I did manage to find myself a couple of the mass retail toys like Grimlock, but by the time I started really collecting, there were a couple of toys that are far from my reach. Like, for example, the Skywarp/Ultra Magnus two-pack exclusive to Target or Walmart or whatever. And back then, well, I didn’t particularly care. I mean, a black Starscream and a white Optimus Prime? Sheesh. But no, I came to regret that decision later on, especially since I’ve amassed myself a sizeable army of Classics Seeker repaints. Of course, Skywarp is one of those dudes Hasbro just loves redecoing Starscream into. He’s probably got as much toys as Starscream himself, without ever doing anything significant… well, anywhere. Ever. He’s got his teleportation gimmick, shows up in practically every incarnation of G1 ever thanks to being part of the original cast, but all he is known for is for his teleportation and nothing else. I, of course, grew to like Skywarp a fair bit. Maybe it’s because he’s a dumb prankster, maybe it’s because I began to play him in the site’s old RPG, or maybe it’s his wicked awesome black-and-purple paint scheme. Whatever the reason, I really, really, really wanted a toy of Skywarp. I did get an Encore version of the G1 toy but that’s all kinds of horrible and he’s been sitting in a box for years now. When the Generations toyline started to adapt designs from Fall of Cybertron, I kind of stopped collecting for a bit because so little from it interested me. I mean, some of the designs looked great on screen, but turned into toys? Yeah, they tend to be overcomplicated messes trying to imitate the game’s complex designs, and end up looking terrible because the Cybertronian modes are kind of crap. And Starscream was certainly one of those I never considered buying, simply because I didn’t like his design. Apparently he’s a pretty solid toy, though, and I had that in mind when I was hunting for toys. Skywarp was one of the more common finds although he doesn’t technically shelfwarm as badly the way the Ammonites and Armada Starscream did. My father was with me when he pointed at Skywarp and said that he’s got a nice colour. So, yeah, I picked him up without thinking too much. After all, he’s a solid toy and I’ve wanted a proper articulated Skywarp toy for a while now. He’s kind of an afterthought because I was far more excited by guys like Scoop and Whirl and Waspinator and Rattrap, and I haven’t really mucked around with him much. He comes with a comic book, an issue of Dark Cybertron in which Skywarp does a grand total of… nothing. He shows up in, like, two panels. Which is idiotic since Skywarp actually plays a fairly big role teleporting people here and there in other Dark Cybertron chapters… but then nobody really cares about Dark Cybertron anyway. So. 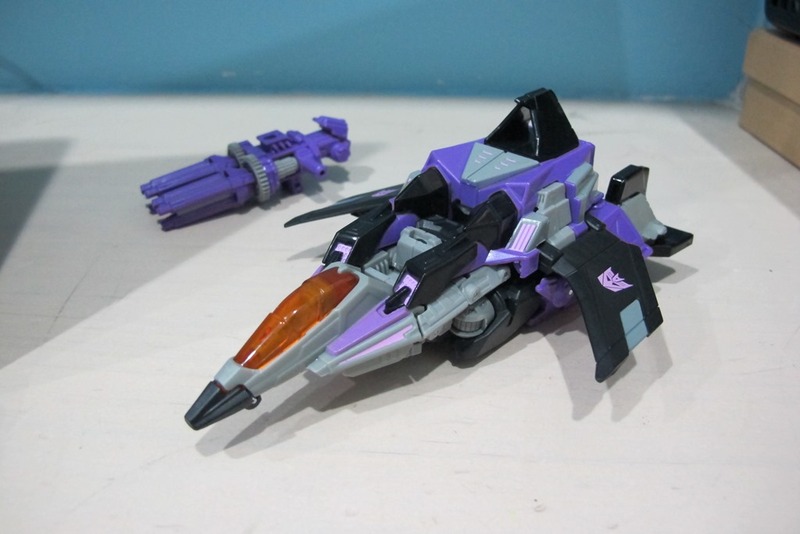 Based on the Fall of Cybertron design, Skywarp transforms into a cybertronian jet. The general shape is based on the flying pyramids tetrajets seen as the Seekers’ alternate mode on Cybertron, but given actual shape instead of just being a random geometrical shape. It’s got a nosecone, forward-swept wings and static tailfins that close together like the tip of a pyramid… and honestly it doesn’t look like it can take off, let alone stay airborne. Other people have attempted far more believable Cybertronian redesigns of the Seeker tetrajet model – Don Figueroa’s War Within, the Titanium toys, Transformers: Cybertron’s Starscream – and this is the worst of them all. It’s a pile of random mechanical parts lumped together rather messily to form… a box with wings and a nosecone slapped onto it. I can’t really fault the toy designers, though, because it’s really not their fault. Skywarp is a pretty good approximation of the game model used first in War for Cybertron, horrible as it is. The Seekers got the short end of the stick among the characters in that game, because the jets made for the Autobot fliers aren’t as horribly clunky as this is. And what the hell are those ‘engines’ supposed to be? They look terrible. The tailfin piece is removable for whatever reason. And unlike the classic Skywarp’s glorious black-with-purple-accents paint scheme, this Skywarp opts for a mainly gray body, with black and purple acting jointly as secondary colours. He’s still got the orange cockpit, even if it doesn’t make a lick of sense that they will have cockpits while on Cybertron. It’s a rather messy and really doesn’t feel too much like Skywarp. This time around, though, it’s definitely the toy designers’ fault since I booted up War for Cybertron just to look at Skywarp… nope, he’s still mainly black there. Skywarp’s robot head and the base of the neck where the head attaches are pretty distinct, considering the space behind the nosecone is an obviously recessed space, and that there’s a fair bit of a gap surrounding Skywarp’s head. Maybe they just didn’t care, or counted on the massive amount of random shapes to mask Skywarp’s head? And this isn’t just me complaining about War for Cybertron’s aesthetics at all… while there are some bad ones, there are a couple that look great. Warpath. Shockwave. The Insecticons. Skywarp just doesn’t fall into that category at all. He comes with a pair of rather massive triple-barreled gatling guns that can be attached under his wings, or combined into a weapon resembling the Neutron Assault Rifle seen in the Fall of Cybertron games, and then be attached to Skywarp’s underside. Since he already looks like a flying jumble of shapes, why not add even more shapes to it? The guns are geared so in their combined form if you rotate a set of triple-barrels you’ll rotate the other. It’s a nice gesture I suppose. Overall, it’s not an alternate mode I will be transforming Skywarp into a lot of times. Or at all after I take pictures for this review. Skywarp’s transformation is at least extremely simple compared to the jigsaw puzzles that are the War for Cybertron toys. And, uh, yeah, I shouldn’t really have bothered. His robot mode is, again, a pretty accurate depiction of the game model, so kudos to the designers for making it work into a physical form, but he looks really chunky. Looking at his arms and legs, he falls halfway of having the G1 ‘made out of blocks’ feel and the Movie designs ‘made out of a thousand moving pieces’ feel, and the end result just isn’t to my taste. His arms especially look weird to me, he looks like he’s got too wide of a gap between his legs. And speaking of his legs, what is up with them? From the knees down they look like… they look like nothing. A lot of transformers have odd-looking appendages thanks to their alternate mode and that’s cool. That’s fine. Skywarp’s large hexagonal legs look ugly in robot mode, look ugly in alternate mode and generally doesn’t appeal to me at all. As a random Decepticon thug it might have fit, but as a representation of the Seekers it doesn’t really do it justice. 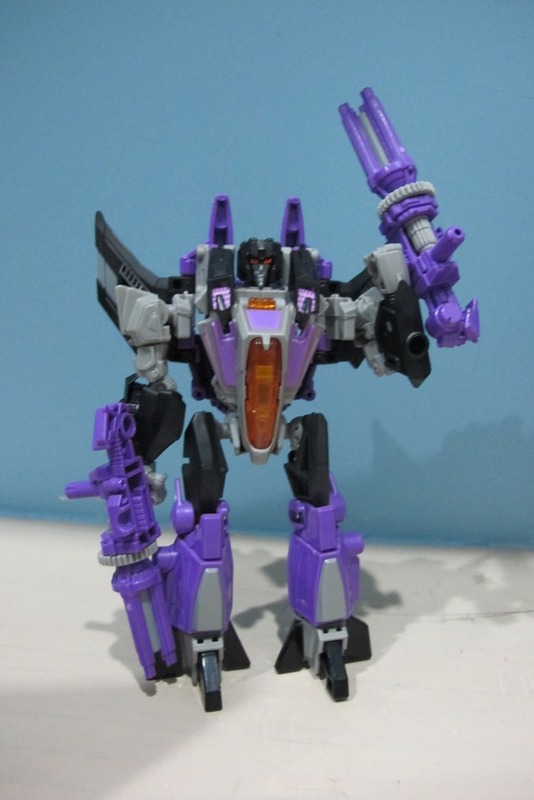 Skywarp is also still mainly gray in this mode, with the black and purple bits concentrated on peripheral parts. It’s not an artistic move I approve of, though the colours do work a lot better in robot mode than in jet mode. He's got these two black bars on either side of his heads that can be hinged up and down to emulate the constantly-moving parts on the WFC models if you leave them alone. Eh. He’s got a decent amount of articulation in robot mode, though really it’s nothing special considering today’s standards. His head can turn, his shoulders are ball-jointed, his elbows are double-jointed, his wrists are ball jointed, his wings can waggle a bit, his thighs are ball-jointed, his knees are hinged and his ankles are hinged sideways. And he can wiggle his toe. He’s got good balance and can strike a fair bit of poses, so he’s solid in that aspect. Skywarp can hold the chainguns combined or separately in this mode, and they can either be held in his fists or attached to the pegholes on his wrists in an approximation of the original Seekers’ shoulder-mounted cannons. I find that attaching the weapons to his fists is a bit of a messy affair. The guns have a sizable part that juts backwards, and these like to catch onto the randomly raised panels on his lower arms. Or it could just be me nitpicking. Anyway, looking at him without considering his looks, there isn’t really much wrong with his robot mode. It’s your standard deluxe class fare. But when you take his aesthetics and colours into consideration? And considering how great a lot of Hasbro’s recent output is? I find I can’t bring myself to really like him. He’s barely okay at best. Transformation Design: 5/10 It was simple and did what it needed to do, conveying both a great robot and alternate mode. Durability: 9/10 I threw him down onto the floor. He didn’t break. Aesthetics: 2/10 He’s based on the already ugly game design, and he is coloured wrongly to boot. Skywarp is supposed to be mainly black with purple hgihlights, and a bit of gray but only in robot mode! The end result of using a mainly gray with a lavender shade of purple ends up making him look bland. And he is absolutely messy in jet mode. Articulation: 6/10 He’s got the standard deluxe class articulation without the waist, and has pretty good balance. The elbows are a bit annoying because they can only hinge in one way and the thinner upper limb likes to move out of place and make his weird-looking arms look even weirder. Fun: 6/10 Eh, he’s an alright toy, I guess. He’s easy enough to transform and he’s got fun guns. Price/Value: 2/10 I feel robbed. I would rather pick up that glorious-looking Armada Starscream. Overall: 4/10 Skywarp is an alright toy! He’s got a simple and nonfrustrating transformation, he’s show-accurate, he’s got great articulation, great accessories… it’s just that he doesn’t look much like Skywarp, and he’s one ugly-looking design. He’s just so average all around that I’m pretty sure in a week I’ll forget he even exists if I’m not looking at him directly. If Hasbro decides to make a proper retail-version repaint of the Classics Seeker mould, this one is probably going to be given away to younger cousins faster than a Skywarp can teleport. Not recommended, you're better off buying any of his wavemates or the various Skywarps that have come before him. Unless you're actively making a War for Cybertron shrine, this one is an easy pass.